I first met the late Arthur Canter about five years ago, shortly after arriving in Iowa City. He would come to the library every few months and check out a stack of recordings and books to aid in his writing of program notes for a number of performing organizations around town. Arthur liked to stop by my office and chat about local performances, painting, the workings of the mind, principles of a good program note, and his love of music. The first thing I learned about the Canters was that they went to just about everything. They attended Symphony concerts, faculty recitals, Hancher performances, art shows, Libraries’ Friends events, all with a fervent interest. However, Arthur’s enduring love was opera. He saw his first live opera, Gounod’s Faust, in 1938 at the Met. “Looking back at it, I hardly think Faust is an ideal choice for a first opera, but I had no choice and no advice. I went and ate it up. 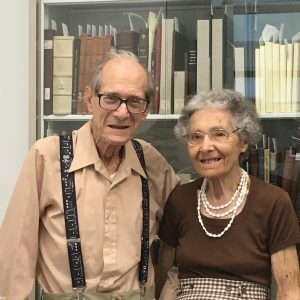 I was positively thrilled…and became a confirmed opera lover ever since.” Biographies of opera singers and books on the extravagant art formed the core of his personal music library, which he donated to the Music Library just a few weeks ago. I was surprised to learn that Arthur was not a practicing musician. His knowledge and experience of music came from listening to recordings, attending concerts, and reading books and articles. Arthur was well versed in Western art music repertory, but was aware of its exclusivity. To that end, he often donated sound recordings of underrepresented or lost works to the Music Library, including music by women composers, and Holocaust victims and survivors. In 2014 (my first year on the job), I learned that a group of friends had raised funds so that the Rare Book Room could be named in honor of the Canters. Arthur walked up to me soon afterwards with a twinkle in his eye and pronounced, “I’m a rare book!” Arthur was accurate in a more literal sense; he is the author of a book in the Rare Book Room titled Tonight’s Program which includes twenty years of his program notes, written for performances at Hancher Auditorium. I remember unlocking the door of the Canter Rare Book Room two years later in 2016 so Arthur and Miriam could see it for the first time. Arthur was wearing musical suspenders and both he and Miriam were beaming. I made sure to show him Tonight’s Program, his rare book, on the shelf. In the last year or so, Arthur and Miriam attended few programs around town. Arthur’s hearing was in serious decline, and it broke his heart that he could no longer hear the music he loved. He returned to exploring the visual arts, mostly producing pencil sketches and watercolors, several with musicians as their subject. Arthur believed that the visual and musical arts were more deeply entwined than most believe, and would talk at length about the role of color or timbre in musical perception. Even when he couldn’t hear music, he never stopped thinking about it or wanting to talk about it. This dogged curiosity and thirst for knowledge, for connection, is what I will miss most about Arthur. To my mind, there could hardly be a more fitting space to bear the Canter name than a room that melds together music, libraries, and a persistent pursuit of learning. It will be a privilege to share Arthur’s story and passion for music with Library patrons for many years to come.